The RECARO Style “Topline” offers the following equipment over and above the “Sportline” variant; the RECARO Vent system, seat heating and electric recline adjustment. The seat combines comfort and ergonomics. RECARO's “Sportline” XL style is also available for very tall drivers. 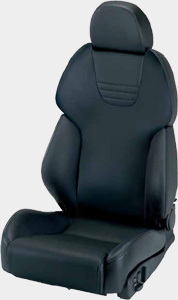 Extendable, fully upholstered headrest, adjustable for height and tilt providing optimised crash protection. RECARO Style XL: 60 mm higher than RECARO Style. Backrest + 40 mm, headrest extends by an additional 20 mm. Contoured shoulder area to relieve muscle tension. Lumbar support provided by the RECARO Airmatic lumbar system: twin air chambers featuring individual electrical adjustment (electronic adjustment). Adjustable side bolsters: optimal side support prevents muscle tension. Backrest tilt-forward release on both sides for easy operation. Electric height adjustment with integrated tilt adjustment gives: correct body angle, the best possible angle of vision; with touch control switches. RECARO Vent system for a pleasant seat climate (electronic adjustment). Seat cushion extension: better thigh support to relieve muscle tension. Electric recline and seat heating. RECARO Style for average-sized drivers Extra high backrest (RECARO Style XL) for the much taller driver.